Pizza margherita, bagna càuda, fettuccine Alfredo, panna cotta—who doesn’t love a good Italian cuisine? Italian specialties have slowly evolved through the centuries due to the social and economic changes in history. But even then, it continues to satisfy the taste buds of food enthusiasts and hungry diners around the world. Many restaurants have opened in big cities and small towns to meet the needs of the public, but it’s their appetizing menus that make them unique enough to stand above the competition. A food menu basically defines the different meals and dishes served at the restaurant or stall. The key elements of your menu can easily influence a customer’s decision by building a thought in their head that’s hard to shake off. For instance, the way items are priced and grouped in the menu can sometimes give an illusion of the dish seeming cheaper than it actually is. For restaurants that offer a wide variety of food, keeping the menu properly organized should make it easy for customers to place their order and hasten the order time for servers to accommodate other guests. It’s important to be strategic when designing your food menu; otherwise, your customers may end up leaving the premises with an empty wallet and an unhappy stomach. Some customers enter a restaurant not knowing what to order, especially when it’s their first time there. Instead of playing a guessing game of what’s available, customers are offered a restaurant menu that they can browse through. 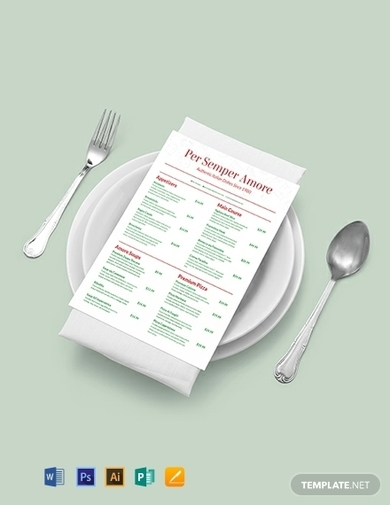 Menus in restaurants are often divided into different types to cover their wide range of offers. The restaurant menu may include a chalkboard menu, a table tent menu, and the main menu card. 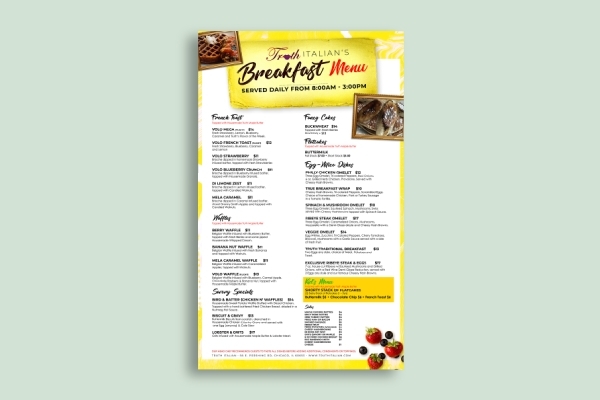 The template above allows you to incorporate these menu styles into your own design to give customers an efficient dining experience at your restaurant. You can also customize the template to meet your personal requirements and reflect your brand identity. Most small-town restaurants are managed by families who whip up their dishes from their own home-grown ingredients. But because these restaurants aren’t as crowded as those in the city and can only accommodate a certain number of guests at a time, choices in the menu are fairly limited. A simple menu should help you relay a complete list of food and beverage items that are served at your restaurant. This should also leave you with enough space to describe each Italian dish for diners who might not be familiar with your offers. You can even add a few images of your signature dishes to entice customers and upsell some of your featured items. 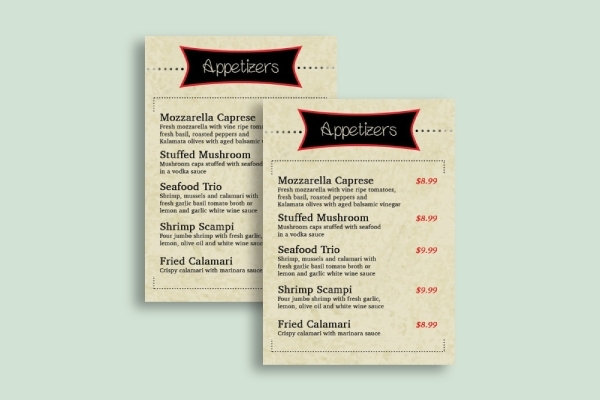 The menu card can come in various sizes, depending on the amount of information you wish to include. While hot pizza pans and spaghetti plates have become a common Italian specialty served in our own dinner tables, the Italian cuisine is recognized for its food and beverage varieties that some people might not be familiar with. Large restaurants are known to have a vast selection of well-known and uncommon dishes to suit the demands of their general audience. 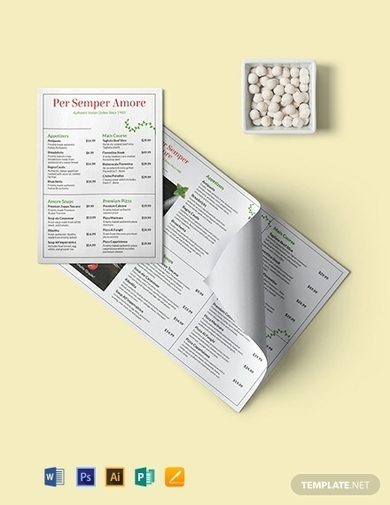 Because of this, menus of different categories and sizes are produced to relay the necessary information. 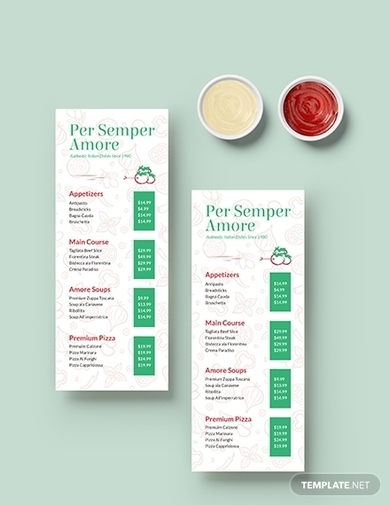 Shown above is an example of an Italian appetizer menu that diners can use to order something that will stimulate their appetite. By designing a separate menu for this food and drink options, customers will feel compelled to order an appetizer even when it wasn’t something they considered doing in the first place. This even allows you to widen your selection of offers for customers to choose from. Restaurants that operate from as early as 8 a.m. to as late as midnight often serve breakfast meals to cater to the demands of diners. Even if it’s past noon, customers would still want to enjoy a warm plate of breakfast food for lunch or dinner. However, it’s a good idea to separate your breakfast menu from your main restaurant menu so it doesn’t outshine the rest of your offers. This is also a good marketing technique for restaurants that have a lengthy list of options for their breakfast-loving customers. If necessary, you might want to indicate the time frame for when your breakfast meals are available so customers are guided during their next visit. Ensure that this is stated clearly in your menu to avoid any misunderstandings. There’s nothing like enjoying a scrumptious dinner at an Italian restaurant that just opened down the street. Italian cuisine is perfect for formal gatherings and fancy nights out with your friends. 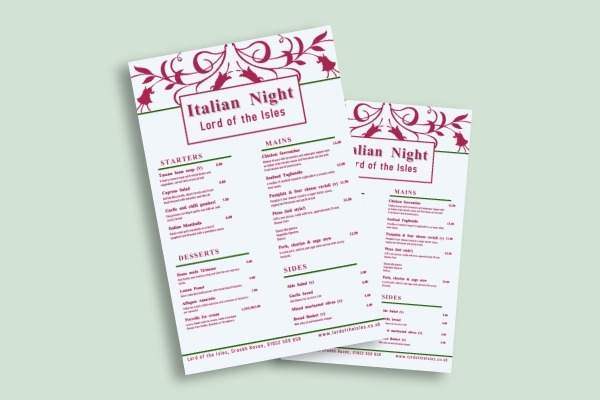 If you’re running an Italian restaurant or want to offer an exclusive night of Italian dishes for your customers to enjoy, you can use this menu design as an inspiration. Its simple yet classy appearance will not only entice customers but also leave an impression worth acknowledging. The layout of your Italian night menu won’t be any different from the rest, but you might want to define each dish clearly for the sake of a customer’s understanding, especially when items are listed in their Italian names.